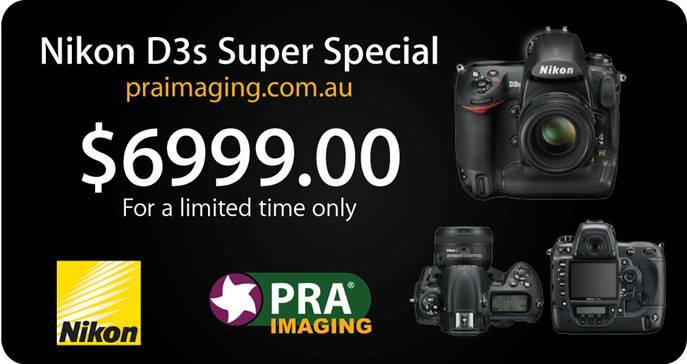 Hi all, thinking of the new Nikon D3s, Brendon from PRA has just sent me this special he is having and it is only for the punters who visit my blog. See below for details. This new camera is pretty hot from early indications, can’t wait to get my hands on it!! I can’t stop thinking how fantastic this baby would be in those low light situations. I am shooting stills in December on the set of a short movie being made in Perth. I hope to be using the D3s for it. More details of the movie shoot to come. Gee i’m really glad I am currently in Canada. I can get it at The Camera Store in Calgary for $1700 cheaper. Although I’m still not going to. I did manage to get the new nikon 70-200mm f2.8 VRII for $1300 cheaper that what I would pay in Perth. It is a shame things are so pricey back home. yeah it is stupid how much extra we pay, it is because the Australian distributors can’t buy it for the same price as the other distributors in the world, we should all complain to the big companies not to our local retailers.